Do you remember tha t on the Cancer page, I mentioned that I would get to the “sheepfolds” later? There was a definite hint in the names of Cancer’s stars that there would be something about this sign and its decans that would have to do with a sheepfold. Here it is! For this is the picture of that especially loved and supernaturally cared for little nation of Israel. Jesus said in John 10:16 that He had “other sheep” that were not “of this fold.” Here is the picture of our Lord telling His “little sheepfold” that His plans included reaching out with the Gospel to “other sheep” who were the Gentiles. In this one verse we see both THIS sign and its larger counterpart, Ursa MAJOR – the Greater Sheepfold. There is an interesting astronomical fact in this sign. Because of the precession of the equinoxes, the position of true north, or the true pole around which the earth rotates, was in the sign of Drago when these charts were first drawn. Today it is in this sign — the Little Bear. In about 11,500 years from now, it will be in Lyra. It’s interesting that when these charts were first drawn, this world did most certainly “spin” around the plans of Satan (Drago). But today it spins about the plans of God for a tiny nation called Israel! It is through this nation that ALL of the earth will be blessed! And what is more amazing than the fact that this is all portrayed in the stars is the fact that the star that is now the pole star was named Al Ruccabba (“turned on”) by God more than 6000 years ago. The original figure was undoubtedly a smaller cattlefold (see the meanings of the star names below), thus picturing the nation of Israel. 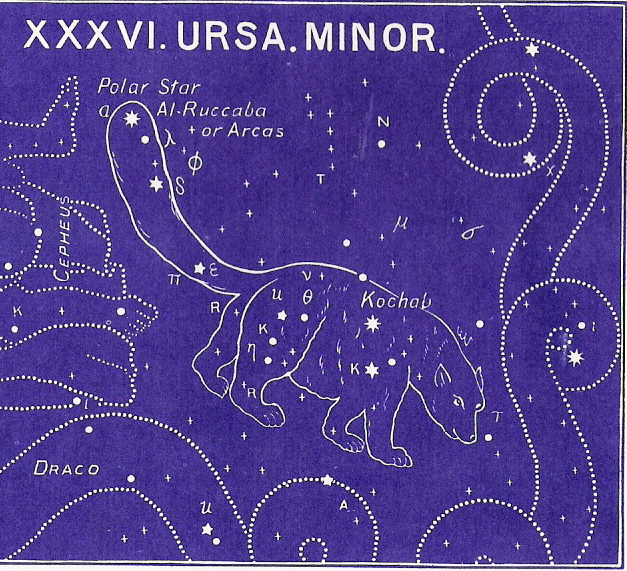 William T. Olcott has said, “By no stretch of the imagination can the figure of a bear be traced out of the stars in this region, and it is one of the great mysteries as to how the constellation came to be so named.” All ancient charts — from Chaldean to the Iroquois Indians of America — show this region as a bear! The Indian legends associate this sign with a true and dependable guide for the lost and frightened. Remembering that we are in the millennial kingdom at this point in the star-study, we see that sin is a problem, even in the paradise of the Kingdom of the Lord Jesus Christ. But we see that the security of the Redeemer’s beloved ones in this smaller (and in the next, larger) bear. the word “bear” is without doubt an early corruption (see The Star Names below). It was originally the Hebrew word for “cattlefold” or “a herd of animals.” So, we see the beautiful truth of this portion of the gospel. The Redeemed are as safe as our Good Shepherd can make us. He is the door to the sheepfold, and He is the one who lays down His life for the sheep. Pay careful attention to the meanings of names of the stars. They will always back up the message above. To continue in the correct order of the ancient star chart, please select Ursa Major next.